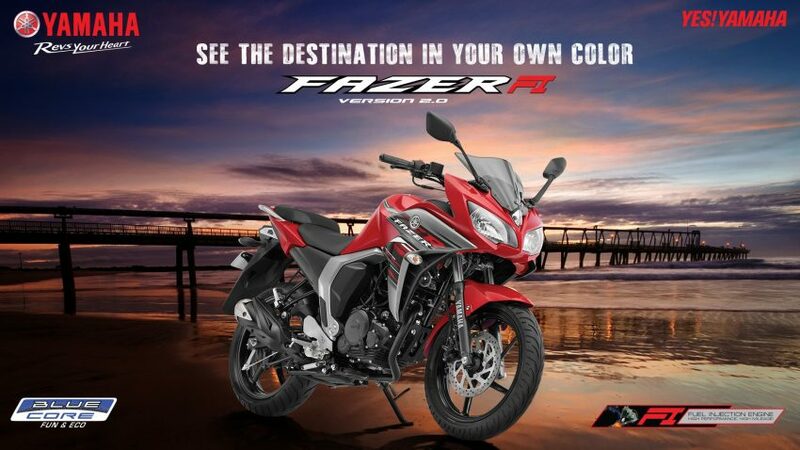 The beautifully contoured and color-coordinated aerodynamic cowling of Fazer FI keeps the blasting wind at bay. 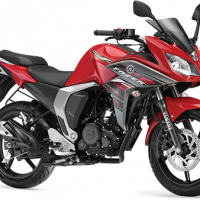 With its comfortable riding position and seat, the rider can enjoy a weekend getaway or head off on a touring holiday. 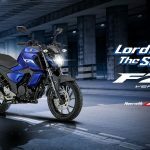 The all new YAMAHA Fuel Injection(FI) Blue Core engine of YAMAHA FAZER FI uses advanced sensors and actuators to calculate and deliver the optimum amount of fuel to the engine – enhancing both performance and mileage. 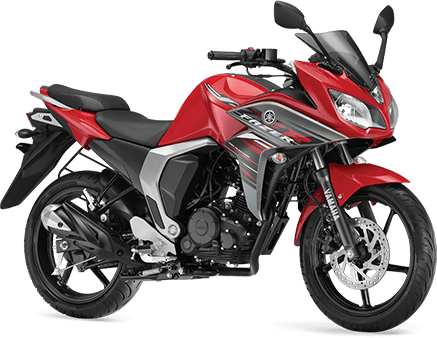 A new 149cc engine with a compact hemispherical combustion chamber designed to deliver better fuel economy and acceleration performance has been developed. It achieves a 14% improvement* in fuel economy. 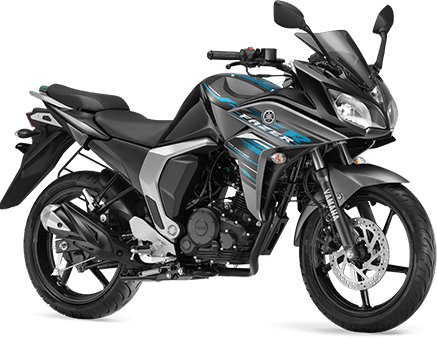 The bore x stroke dimensions are 57.3 mm×57.9 mm, making it a relatively small bore engine, and its intake/exhaust valve layout is designed to best match the hemispherical combustion chamber. In combination with the optimized intake and exhaust port shapes, this design increases combustion speed and helps achieve excellent combustion efficiency. 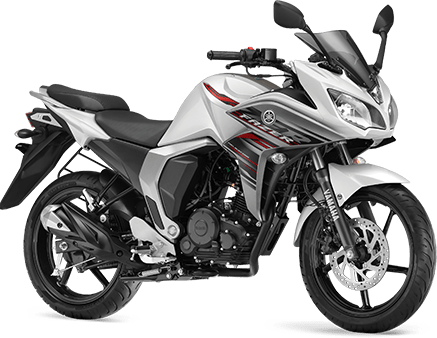 The new engine gives the feeling of acceleration while retaining the excellent performance qualities and improves fuel efficiency, so your every ride is guilt free. 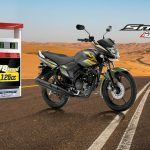 Mileage 14% up for new Fazer FI versus Fazer carburetor. The aerodynamic cowl’s carbon pattern enhances its sporty image and allows for a better and resistance-free riding in any condition, so that you can ride longer with less fatigue. The perforated single disc adopted for Fazer FI ensures perfect braking control in any situation. The two-pot caliper makes full use of the outer perimeter of the disc to provide strong stopping power. FAZER FI’s 7-times adjustable monocross suspension is of World Motocross Championship standards. This type of suspension gives the rider an exhilarating and stable riding experience. 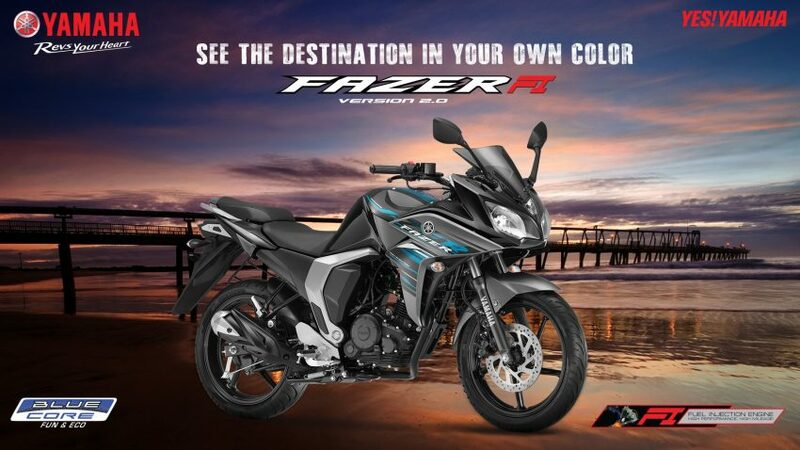 The stylish & sporty twin headlights of FAZER FI are designed keeping in mind the YAMAHA DNA. These 12V, 35W twin headlights don’t just look good but also give clearer vision at night so that you always stay safe. “Stop less, tour more” says Fazer FI. 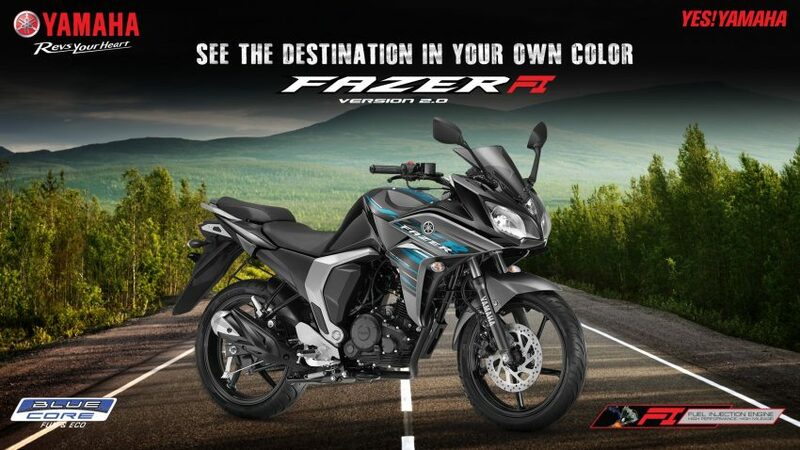 A 14Liters fuel tank makes Fazer FI go on for miles and miles. So you can enjoy your weekend ride without so much as thinking about a pit stop. 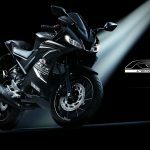 The advanced midship muffler, with its advantages of mass concentration, weight reduction and shorter length, is adopted in the new FAZER FI. 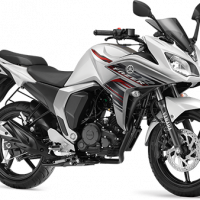 The midship muffler adds a sporty attitude and enhances the street presence & stability of this powerful bike. The euphoric notes of the muffler make sure that you never go unnoticed. 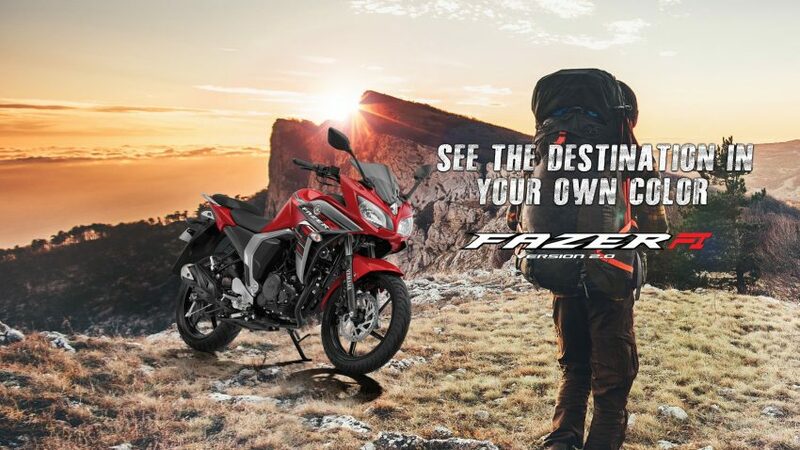 Cool and exciting graphics make the bike look super-stylish. The graphics give the bike a contemporary and sporty look and make sure that it’s an absolute head-turner. The split seat offers equal comfort to both the rider and the pillion so you enjoy long rides more often. This comfort is enhanced by the slip resistant material that provides the pillion a good hold of the seat even during panic braking.